Best Cancun Beach Hotels with Spa! Choosing one of the very best Cancun beach hotels will make your beach vacation in Cancun the very best it can. Make it a Cancun waterfront hotel with a luxurious spa and you will most likely have one of the most memorable and relaxing beach vacations ever. 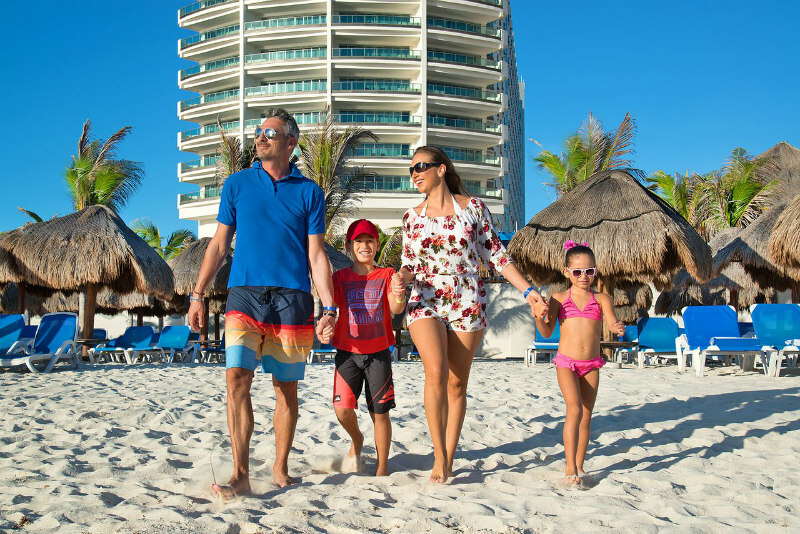 Whether it be family friendly hotels or adults only resort, Cancun has what it takes to make your beach vacation the best it can be. Cancun is one of the most popular and best waterfront destinations in Mexico for tourists looking for fun in the sun. Filled with so many activities on its beautiful beaches, you will definitely want to find the best hotel on the beach to make the most of your time in this fun filled tourist destination. Planning is the key to the most successful and memorable Cancun beach vacation. Try to book early. Generally speaking 4-6 months ahead of time will get you some great deals as well as the best choice of hotels. Try to avoid hurricane season. August to end of October could lead you to regret your vacation. December to end of May are best. With many all inclusive hotels on the beach to choose from, warm weather and a tourism industry ready to serve, a Cancun beach vacation is a great choice. Number one on the list of family friendly all inclusive Cancun beach hotels has to be The Grand at Moon Palace! Some have said that there are so many activities and fun things to do for the kids that you will never get to hear the words "I'm bored"! But no need to worry about not having things for grownups to do either. They have a 27 hole Jack Nicklaus signature Golf course! A beautiful spa with great treatments and a fitness center of course. Here is their vast list of activities. Videos are the best way to learn about what makes this Cancun waterfront hotel the best all around hotel. Here is the facility's photo gallery including videos to help you see what makes this beach hotel our #1 overall pick. Read the reviews and booking information here. If you are looking for adults only accommodations, their sister hotel, The Sun Palace is ideal for romantic couples. Sitting in the middle of the Cancun beach hotel zone the Le Blanc Spa Resort is an adult only luxury waterfront spa resort offering a fantastic white sand beach. 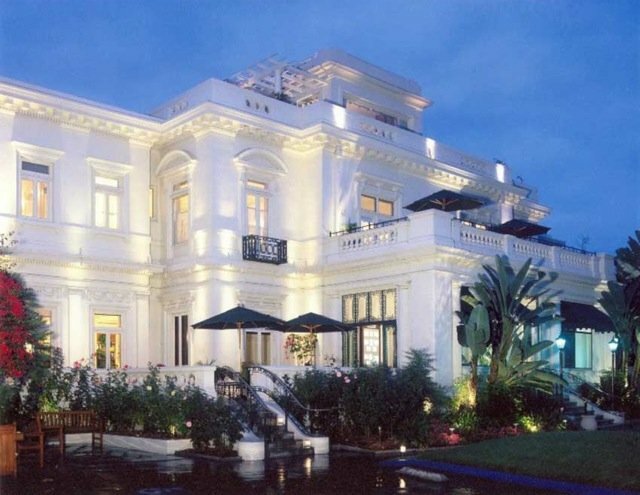 The service is ensured with a butler to look after your requests personally. Enjoy the romantic 2 person whirlpool tub in the privacy of your exquisitely designed room. Two of the pools have swim up bars and the pool attendants are happy to ensure your towels are ready. The Blanc Spa will refresh and relax while the fitness centre will keep you toned. All efforts are made to ensure your stay is is memorable for all the right reasons. A deluxe, all inclusive waterfront resort that is family friendly. Your family will enjoy the various activities that include a water park, 3 outdoor swimming pools, zip line, mini golf and climbing wall and much more! 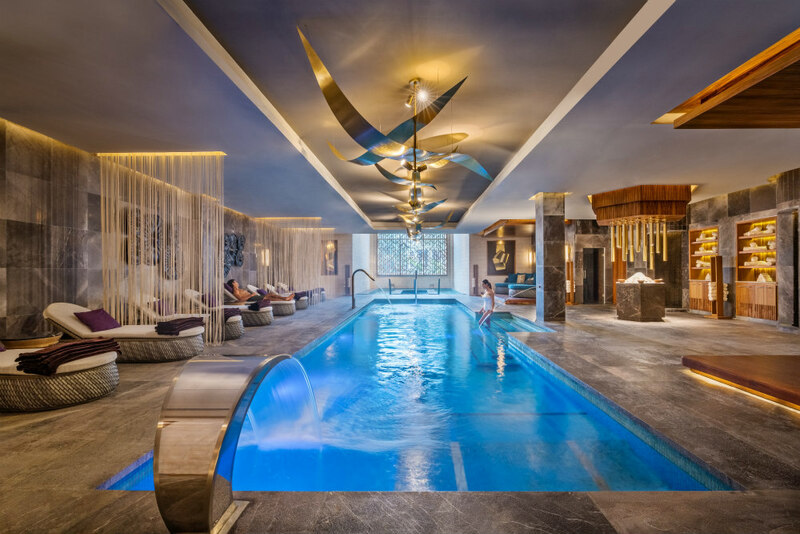 While the kids are enjoying themselves in the kid's club, parents can enjoy each other in the adults only pool or get a couples massage at the Spa. The Spa offers a wide variety of treatments to suit your needs. A good value Cancun beach hotel with TripAdvisor's Certificate of Excellence Award. 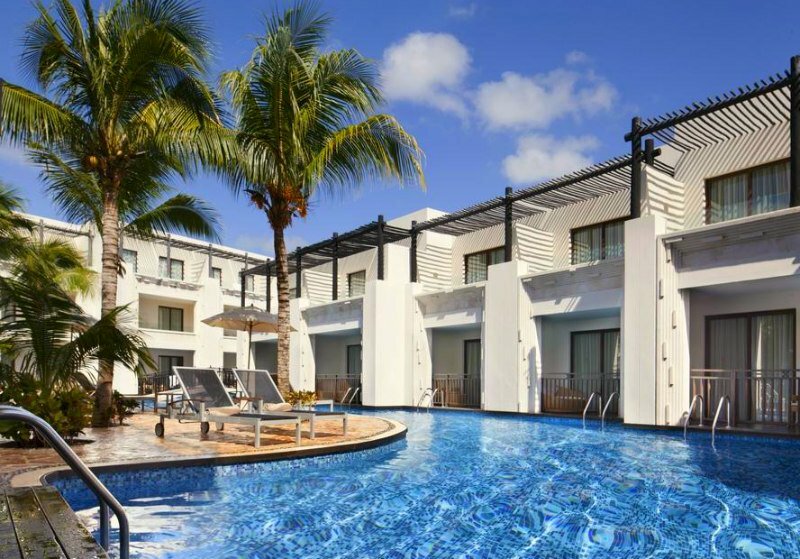 A TripAdvisor Travelers' Choice 2019 Winner as well as Certificate of Excellence award winner this beautiful Couples only, Adults Only Cancun beach hotel is sure to bring out the romance in any relationship. The suites come with double whirlpool tubs and a mini bar filled with world class spirits. 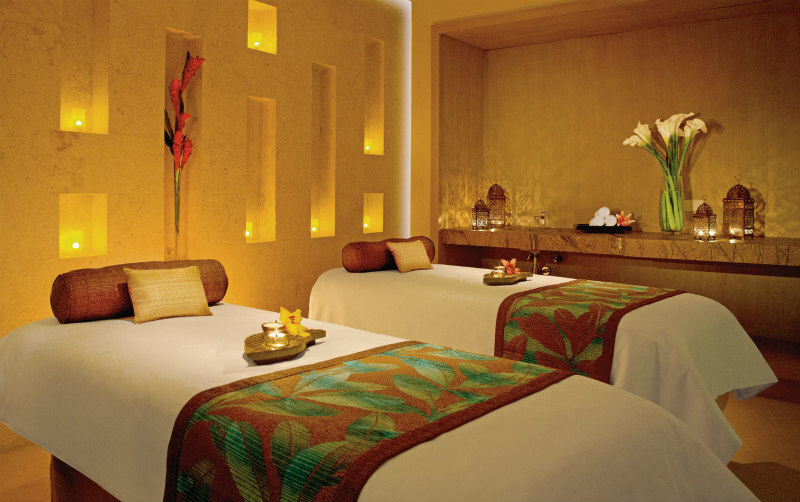 As a couple you will feel refreshed with a couples massage at the Awe Spa. And if you like your toes tickled... you will want the Garra Rufa Fish Spa for your feet. To look the best you can be for the evening you will be enjoy more pampering at one of the salons. At night you will enjoy romantic dinners, watching sunsets from the infinity pool and nightly evening shows. Go ahead... connect or reconnect with the one you love. NIZUC Resort and Spa superb beach. Many times, a picture is truly worth a thousand words. The beach at NIZUC Resort and Spa is absolutely stunning. Of the many Cancun beach hotels, this Award Winning, 5 star luxury hotel is one of the very best. Located on a 29 acre nature preserve at the beginning of the Riviera Maya in stunning Punta Nizuk. You will love the tropical foliage of this beautiful property and surroundings. Of course, since this is a Cancun beach resort and SPA, we truly would not do any justice if we did not mention its 30,000 sq. foot spa which is a main feature of this resort. The NIZUC Spa offers "Couple's Rituals" where a couple may spend the day in private spa suites with privacy. This resort is highly recommended for a more intimate and romantic experience in Cancun. It is also a family friendly resort with a kids club. Get more information here . 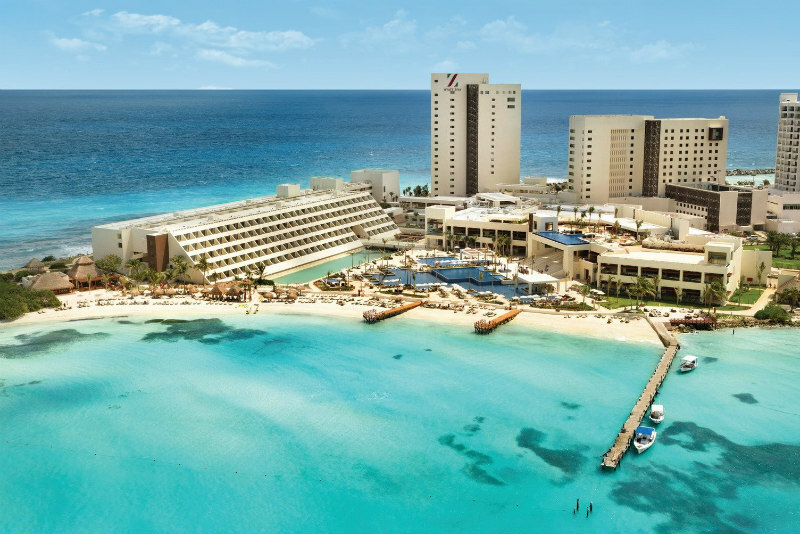 Located at the north end of the Cancun Hotel zone, the Hyatt Ziva's location on the peninsula (surrounded by 3 sides of Caribbean Sea) takes full advantage of it prime location and has more beach area than probably any beach hotel in Cancun. The size of this resort features the adults only "Turquoise" section as well as a family friendly section. The list of activities offered is one of the very best in all of Cancun. Enjoy three infinity pools or book your very own swim up suite. The Zen Spa offers soothing treatments with massages as well as massage waterfalls as well as a hydrotherapy circuit facing the Caribbean Sea. A state of the art fitness center awaits you so you will not have to get out of your fitness routine. Another TripAdvisor Traveler's Choice award winner for one of the best Cancun Beach Hotels. Sometimes it's not about the beach. Sometimes it's about golf or tennis and the beach! Enjoy your game or games at this Cancun beach hotel. The Royal Service adults only waterfront resort will give you the best of both worlds. Imagine a nice fun but competitive game in the morning, a nice brunch, a little break by one of the four lagoon style pools in the afternoon, a relaxing spa and beauty salon experience in the early evening. Speaking of spa experiences... you will enjoy the YHI Spa. Their vision is to have guests enjoy "a feeling of calm" through their water ritual area and Asian inspired Eco-Spa. Of course, after your spa and salon experience, a fantastic dinner awaits you at any of their 9 restaurants and 8 bars. Also, should you need a snack at any of the 24 hours in the day, they will be happy to prepare something for you. This is a very good choice for adults seeking privacy in a 138 room resort. The Secrets the Vine is an adults only Cancun beachfront resort worthy of its 5 stars. Its 12,500 square foot luxury spa has a wide assortment of treatments on their spa menu. Located in the middle of the Cancun Hotel zone, it is conveniently located to any other entertainment you may wish to visit. 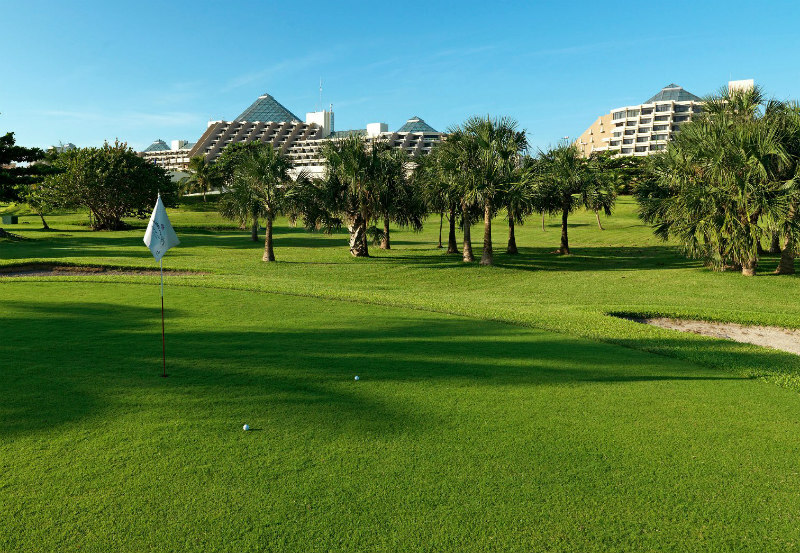 As a guest of this very fine luxury hotel you will also be able to enjoy one round of golf per day per person at the Greg Norman Signature 18 hole Playa Mujeres Golf Course! 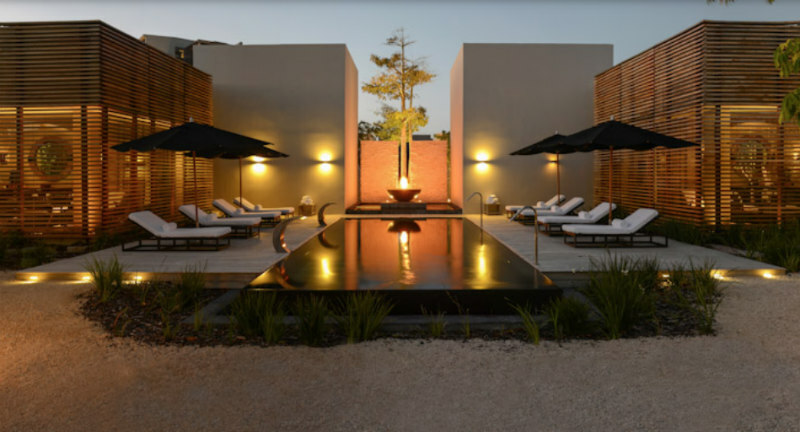 Choose from two gorgeous infinity pools as well as a terrace pool. Since this is an adults only resort, you will be able to enjoy a variety of fun sports such as volleyball and improve your dance moves. A TripAdvisor Certificate of Excellence award winner makes it a great choice! The Live Aqua Beach Resort and Spa is one of the adults only Cancun beach hotels along the Hotel Zone of Cancun. A 4.5 star resort as well as a 2019 TripAdvisor Travelers Choice award winner makes this hotel another very good choice. The resort was finished its total refurbishment in December of 2018. You can rest assured of a beautifully decorated room with the latest in technology. The Feel Harmony Spa offers a full menu of services. The MB Restaurant is sure to please wine enthusiasts as it was awarded the Award Of Excellence in 2018 for its wine selection by Wine Spectator. Well reviewed by guests prior to its extensive renovation, you can only expect to be even better than ever! Another great Cancun beach hotel with spa for romantic adults. 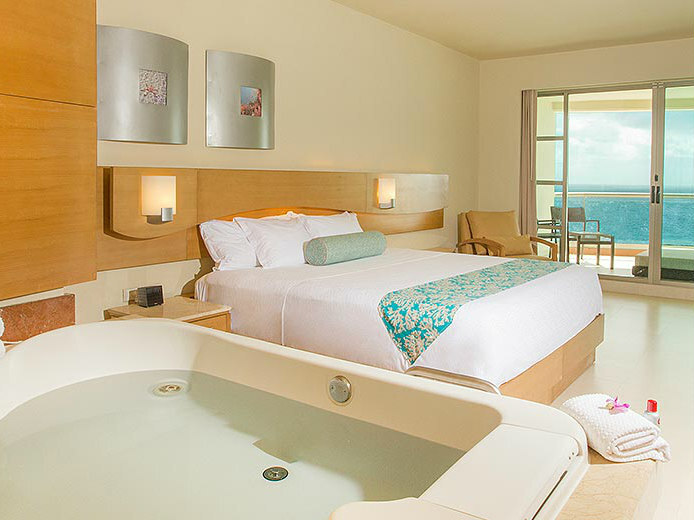 This family friendly Cancun beachfront hotel is located in the heart of the Cancun Hotel Zone. Therefore, you will enjoy the beautiful sandy beach as well as all the amenities around the hotel such as shopping and extra entertainment should you feel the need to venture outside the hotel. 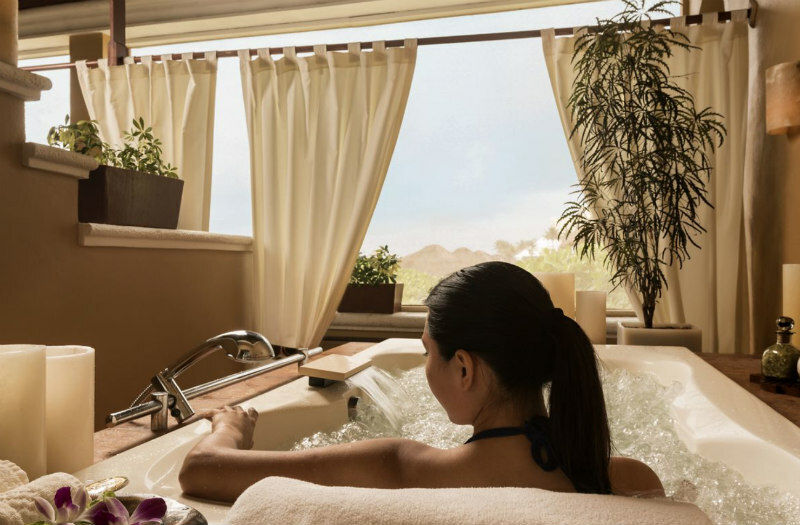 Each of the suites offer a luxurious double whirlpool tub. Free wifi is provided as well as unlimited phone calls to Canada and USA so you can easily keep in touch with your loved ones. Of course, to add to a relaxing vacation, you will enjoy treatments at the Awe Spa. If fitness is what you love, their excellent fitness facility will keep you in great shape as well. This is a very good value 4 star hotel with assured satisfaction being awarded TripAdvisor's Certificate of Excellence award, The 2019 TripAdvisor's Traveler's Choice award as well as a GreenLeaders Gold level eco friendly hotel who cares for the environment. As anyone knows, The Ritz Carlton Hotels are amongst the most luxurious 5 star hotels in the world. Having such luxury on the Cancun Hotel Zone only adds to their indisputable reputation. Located in the heart of the Cancun Hotel zone, you will have access to all it has to offer. The family friendly resort offers the Ritz-Kids club for kids 4-12 so they can be entertained while parents reconnect. Of course there will be many family activities to enjoy as well so the whole family can enjoy time together. The luxurious spa offers treatments and amenities in line with the hotel's reputation of luxury. Hyatt Zilara Cancun "Zen Spa"
Another beautiful Cancun hotel on the beach with a beautiful spa catering to adults only. The Zen Spa is a spectacular 22,800 sq. foot oasis of peace and tranquility. The treatments include relaxing couples massages of various techniques, facial treatments and body treatments. A detoxifying hydrotherapy circuit as well as beauty salon services to either make you look and feel your very best. Here is their full details of treatments and facility. The beach at the Hyatt Zilara is also the longest on the Hotel Zone. So you will definitely want to make the best of it. All suites feature double jetted tubs, private balcony, mini bar that is restocked daily. Truly another great choice of all of the fantastic Cancun beach hotels.